The home that would become Brandon Hall was built on land, originally 798 acres in size, bought by William Lock Chew for $7,000 at public auction in 1809. On this land he built a brick house, consisting of three rooms, approximately 20' x 60' in size - a building that would later become the basement of the Brandon Hall - and with his wife, Rebecca, raised a family there. One of his daughters married a man by the name of Spence Grayson, and the couple produced a daughter, Rebecca Chew Grayson. The poor child died in 1833, aged only two years, and was buried in a tomb with her uncle, Thomas Grayson, "not more than a hundred yards from Brandon Hall". 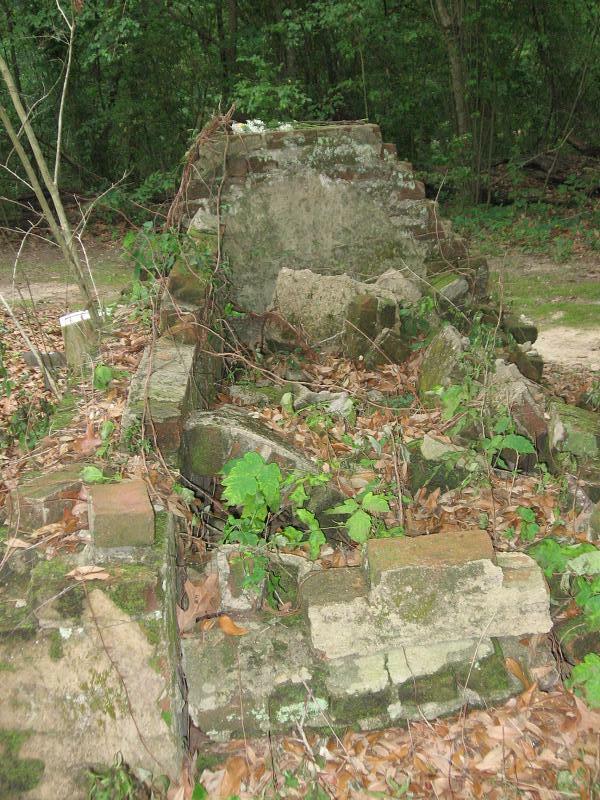 This information comes from a pamphlet on Brandon Hall that was obtained from G.B.R., and he - as well as I - wondered where this mysterious Grayson tomb could be. The small Brandon children cemetery that this site is about is listed on the same pamphlet as being "a stones throw" from Brandon Hall. Could the author mean a "stones throw" to be "not more than a hundred yards"? If so, Little Rebecca and Thomas Grayson may have been the occupants of the crumbled, unmarked grave resting just outside the fence of Old Brandon Cemetery. With the help of G.B.R., I have located the graves of Thomas Thorpe Grayson and his two year-old niece, Rebecca Chew Grayson. Cemetery is situated back of the Brandon Hall house off Highway 61. Leave Washington on Highway 61 - Old Road. Ride about 4 miles to Brandon Hall - turn off to right to the home which is about a quarter of a mile from the highway. Grayson Cemetery is almost within sight of the house, about 200 yards. Cemetery is in bad shape, no fence, stones crumbled. I suppose that puts a bit of a dent into my Chew-Grayson Theory, doesn't it? It's back to the drawing board as far as determining the occupants of the mysterious, crumbled tomb just outside the fence.